With the boom of ebooks, so boomed the ebook formats. Now a dizzying array of choices makes writers and techies alike wonder which formats to use—if not all of them for good measure. Although possible, it’s not necessary. Once explained, you’ll find that ebook formats are a lot simpler than you expected. So, here it is—the essential guide to the best ebook formats. As we go along, I’ll point out the advantages of each format, and you’ll start getting a clearer idea of what each format offers. By the end, you’ll know which formats are best for you and your ebook. Before we delve into the nitty-gritty differences between the different ebook formats, let’s explain some terms that you may have heard flying around, but were never really sure what they meant. Feel free to skim through them quickly. Ebooks are any books that can be read on electronic devices, like computers, tablets, phones, etc. Some ebooks are just like reading from a paperback—no matter how hard you press on the page, nothing happens. In other ebooks, authors have added content that responds when you press/click on it, and so they’re called interactive ebooks. questions that can be answered in the ebook and are instantly corrected. Social Media (live Tweets or real-time Instagram galleries). Sites, like Bookry or Bookwidgets, create widgets that can be customized and added in your ebook. Some of the widgets are free, others aren’t. Either way, they’re definitely worth looking into. Suffice it to say for obvious reasons, I’m really excited about the possibilities that interactive ebooks open up for authors and readers. Unfortunately, not all formats support all levels of interactive content. Don’t worry I’ll tell you what each ebook format supports in this post. An e-reader, also called an ebook reader, is an app or a device that people can use to read ebooks. Just like you need a pdf reader to open and read a pdf file, you’ll need an e-reader to open and read ebooks, simple as that. Some e-reader apps open a wide variety of ebook formats. Other ereaders, like Kindle, open only one format. An ebook app is an ebook inside an app. Kotobee ebook apps come with Kotobee Reader built-in. So, anyone can download your ebook and start reading immediately. There are three different types of ebook apps. Web apps, that can be read in any internet browser. Desktop apps, that can be downloaded on computers. Mobile apps, that can be downloaded on mobile devices, like phones and tablets. Ebook libraries are apps with several (or many) books, plus additional management features, perfect for institutions and writers with a collection of ebooks, serial ebooks, or magazines. Allows designated users to track reader performance and activities inside ebooks and manage access to the ebooks or libraries. The readers are able to login to the same library or cloud ebook in any format (mobile app, web app, etc.) and access all their annotations. Kotobee provides LMS integration with LTI with Kotobee Cloud and Kotobee Library. To learn more read Ebook and LMS Integration using LTI. The idea of selling your ebook brings up a really important point. How do you keep your ebook from getting pirated and distributed for free online? Digital Rights Management. Basically, it lets you manage who has the right to access your digital content, in this case, your ebook. To learn more about DRM, read Ebook DRM & Security: What is it and How it Works. To learn more read Best Ebook Layout Format: Reflowable or Fixed? Briefly here’s what you need to know. 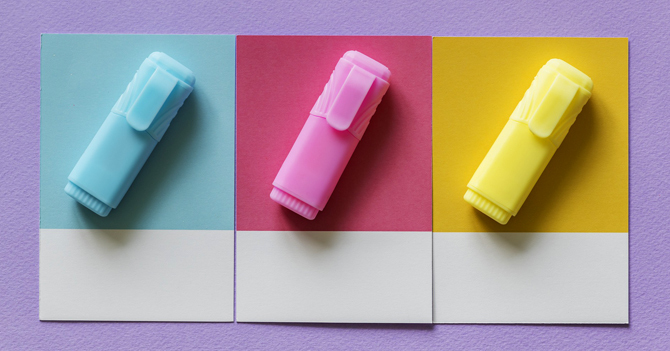 Fixed Layout lets you design pages and set content exactly as it will appear for your readers, like print books. Reflowable Layout automatically resizes and moves content depending on the reader’s screen size (and font size) like web pages. So, now with all the basic terminology out of the way, let’s roll up our sleeves and get into the messier details. How interactive do I want my ebook to be? On which devices do I want my readers to be able to read my ebook? We’ll start with the simplest format, with the least options and work our way up. The simplest and most common format of the lot, PDF, unfortunately, does not support interactive media, much less advanced interactive content. DRM is virtually nonexistent as the only real option you have is to put a password on the file. Its advantage lies in its popularity. PDF readers are readily available for computers and mobile devices, and most e-reader devices are able to open PDF files. So, if you want to distribute an ebook without interactive content, free for the masses and easy to access, PDFs are the best option for you. The EPUB format has been updated, and the old EPUB2 is finding its way out of the scene as the EPUB3 dominates. At Kotobee Author, we export EPUB3 and encrypted EPUB3 files. Similar to PDFs, EPUB2 does not support interactive media and content. 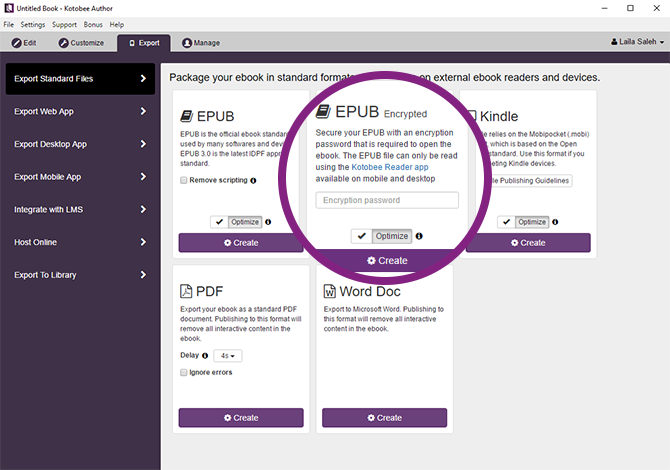 EPUBs do not inherently have a DRM; however, most ebook stores do. So, if you will be selling your ebook through one of the giants like Barnes & Noble or Kobo, your ebook will be for the most part protected. Unfortunately, DRM cracks for the major retailers have been increasing in popularity. Selling your ebook as an EPUB does not mean you are forced to use any form of DRM. Some retailers sell ebooks on an honor system, without any DRM, instead, respectfully ask their customers to not pirate their ebooks. EPUBs lead ebook market sales, by far. And like PDFs, EPUB readers are readily available for computers and mobile devices, and most e-reader devices (except Kindle) are able to open EPUB files. So, if you want to sell your ebook without interactive content, EPUB2 will get the job done for you. EPUB3 is the latest EPUB file format. All that was stated above about EPUBs applies to EPUB3, except one fundamental and colossal difference. EPUB3 supports all levels of interactive content, even book widgets. If you’re using Kotobee Author, and want to limit access to your EPUB3 file, you can export the ebook as an encrypted EPUB for which you set the password. The ebook will only open in Kotobee Reader. Any attempts to open the ebook in other e-readers will fail. In the export window, simply assign a password in the Encrypted EPUB box, then click Create. MOBI’s distinguishing feature is that it’s the only interactive format Kindle apps and devices will open. They can be opened and read on computers and mobile devices, running the Kindle app, and of course, on Kindle devices. The Amazon DRM is designed to protect your ebook from piracy, and unfortunately, like the EPUB DRM, Amazon’s is increasingly easier and easier to crack. As for interactive content, MOBI only supports multimedia files for now. So, if you want your ebook to be available on Kindle, make sure MOBI is on your list of formats. That’s it for the standard ebook formats. All the information is summarized in the table below. Then we’ll move on to ebook apps. All ebook apps types provide the same features. Ebook Apps all provide the highest level of interactive content, Kotobee DRM (in our case), and the same branding and customization options. The major differences lie in the behind-the-scenes technical stuff, that will allow your ebook to be opened in a web browser, on a computer’s desktop or on a phone or tablet. If you want your books to be read online in internet browsers, then web apps are what you’re looking for. Because they run in the browser, they can be viewed on any computer or mobile device. You will need to have a website to host the web app. If you do not have your own website, don’t worry, because Kotobee provides hosting services. If you want your readers to run your ebook app on their computers, this is the option for you. 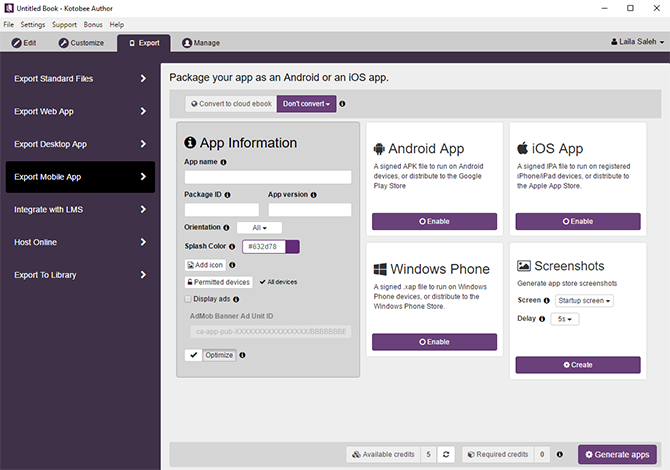 Kotobee provides desktop apps for iOS, Windows, and Chromebooks. So you can create one ebook and export versions for each of the major operating systems. If you want your ebook app to be downloaded from the Appstore for iPhones, or the Play Store for Androids or the Windows Phone Store, then export mobile apps. Sounds like a big step? Don’t worry, we’ll guide you through when the time comes. All that applies to ebook apps above applies to ebook libraries as well. You first create your library, then add ebooks to your library. You can add books as a whole, or chapter by chapter. Then export your ebook library as web, desktop, and mobile apps. The final formats of your ebook will determine the kinds and extent of interactive content you can incorporate in your ebook, as well as the layout of the pages. Your ebook creation software will also affect your layout and format options. Most platforms support limited layout options and export formats. Some, like iBooks Author, require you to pick your format and layout style before you begin. So, you will want to know which format to use before you begin. If you’re really hesitant, consider using an ebook creation software, like Kotobee Author, that allows you to export to multiple formats. Even after you’ve exported a PDF, you can go back into Kotobee Author, add interactive content, and export as an epub or ebook app. That said, if there’s a chance you will only export your ebook for Kindle, try to decide early on. You don’t want to add book widgets or Java Scripts, only to be forced to exclude them in the end. Or create a design rich fixed layout, that Kindle does not support. Before you begin creating your ebook or ebook app, spend a little time deciding how you want to distribute your ebook. The marketability and sales potential of your ebook can be drastically affected by the formats you select, not to mention your profit margin. Standard ebook file formats and ebook apps have the potential to serve multiple, yet different purposes. If you still have any questions, then comment below, and we’ll do our best to help you.